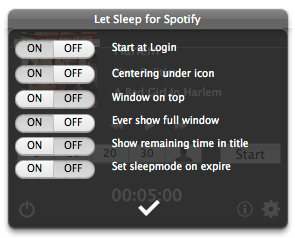 Let Sleep For Spotify requires Spotify App installed. You can get this from Spotify Homepage. 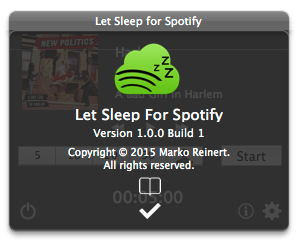 Let Sleep For Spotify after start appears as icon in the statusbar. Click the symbol for open the window. Clicking the symbol when window is open will close the window. 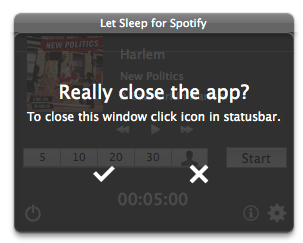 The window shows some informations about the currently playing title in Spotify. If you move the mouse inside the window it will expand and you can see more elements. 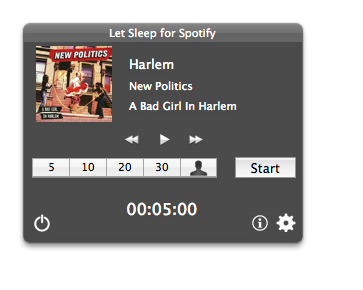 In this control you can choose the time until stopping music. Possible are 5, 10, 20 or 30 minutes. If you click appears a slider. Therewith you can set a custom time between 1 and 120 minutes. If you click timer starts. The remaining time you can see below or in window title. 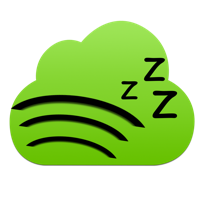 Launch this app when loggin in to MacOS X. If you choose ON the window will appear below the statusbar icon. If you choose OFF you can place the window somewhere on the desktop and it will shown at this place when it appears next time. If you choose ON the window is ever on top to the other windows. If you choose ON the window ever appears in full size with all elements. If you choose OFF the window will reduce his size if the mouse leave the window. If you choose ON the remaining is shown in the title of the window when timer starts. Here you will find important informations about the app. Therewith you can terminate the app. If you only want to close the window, click the icon in the statusbar.